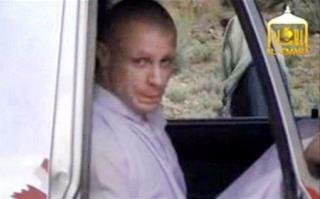 (Newser) – The back story of the Bowe Bergdahl swap gets one detail richer today by way of a Wall Street Journal report on a classified assessment that found two of the five Guantanamo detainees that were to be released would likely end up back in a senior role with the Taliban. The news comes via unnamed US officials, who say the assessment—the work of spy agencies and completed while the swap was being debated—found that two others would likely take up active roles, while just one of the detainees would likely steer clear of the Taliban. The Journal sees the assessment as "ammunition" for lawmakers who have dubbed the swap unwise; one official counters that it's "not a rigorous mathematical equation" but simply a forecast of what could happen based on the men's former positions, connections, and experience at Gitmo. Republican Logic W releases 500 from Gitmo: Non-issue 13 embassies and consulates attacked under W: Non-issue W lies to start a war that kill 4,000 Americans: Non-issue Dollar and Stock market in free fall under W, GM nearly liquidated: Non-issue McCain is actually born in Panama, for real! : Non-issue W's policies actually make most of the world hate us and double terrorists: Non-issue Boatload of evidence shows Obama born in Hawaii: Lies!! Obama went to church for 20 years: He's a secret underground Muslim! We are the world's only nation without maternity leave: He's a socialist!! An Embassy attacked / diplomat killed under Obama: Obama did it!!! He killed him! Obama lets 5 guys out of Gitmo to get American back: Well, now we have a terror nightmare! Only in America we investigate why a soldier came back alive while ignoring why 4400 came back in boxes. Clinton left an innaugeration gift for Bush called the 9/11 plans, stafffing, and testing. IT was all done on Clinton's watch. Barry needed to leave a gift of his own for the inevitability that a Republican wins. This goes a long way to planning the sequel to 9/11, which was made possible by actions done by Clinton who said, "I was NOT going to be the one who took away civil liberties of this nation or other people visiting the USA."